I purchased some sheets at a thrift store that I thought would be really cute for nightgowns, but before I cut them up, I remembered I saved some of the girls’ crib sheets. They are the leftovers from these T-shirt transformations. I can’t really come up with a good reason for saving them other than sometimes I’m a little too much like my mother. I cut the collars off the T-shirts and four rectangles from the crib sheets and came up with some pretty simple nightgowns for the girls. I even got someone to model for me. This is the only picture that she stopped moving long enough for the picture to be clear. Kind of. I’m not sure if it was the fabric or the nostalgia, but I could smell baby formula through most of this project. Although I’ve never looked that pillowcase dress instructions, I suspect that this project is very similar. Not a great picture, but it isn’t a very exciting T-shirt anyway. 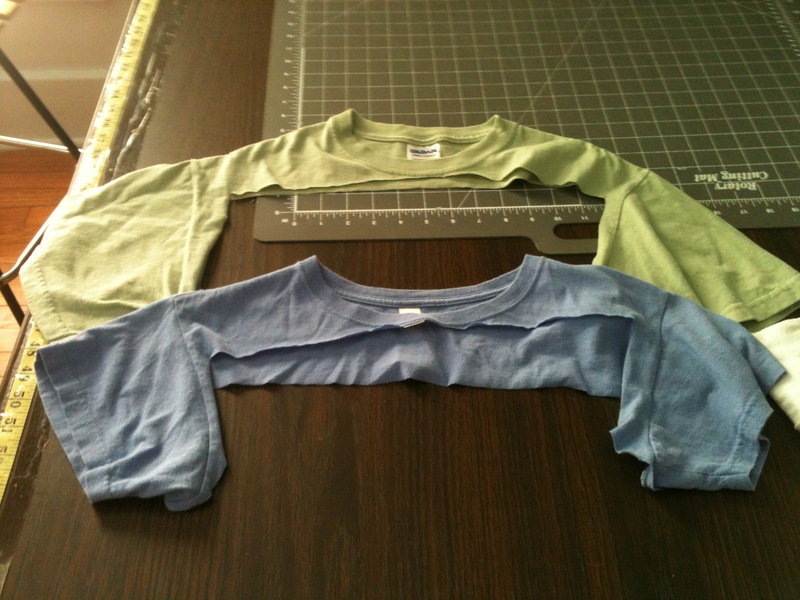 I traced a pair of my son’s jammies onto the shirt and cut it out. There was almost enough fabric to make them without piecing anything together. The rise on the shorts would have been a little too short though, so I cut a waist band from the sleeves. Slightly more than an hour later, and we have a new pair of PJs. I love it when projects go quickly and mostly as planned. Wonderful! I never would have thought to use the neckline from t-shirts at the top of the “pillowcase” nighties. It makes sense, though, and you don’t have to bother with tying the shoulders every time you put them on. And the boy’s jammies are brilliant. I’ll have to remember that for my new grandson. Well done! I liked that I knew the necklines would be big enough too. Clever! You are so handy! Thanks! Both projects were very simple.